The team at Bishop’s Cellar is very excited to have gotten their hands on this older vintage of one Chanrion’s Côte-de-Brouilly. It’s not everyday you get a chance to drink premium Beaujolais with bottle age. 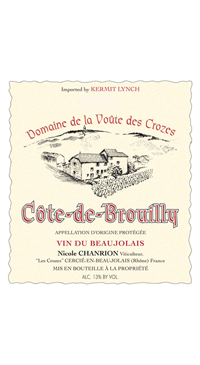 The Côte-de-Brouilly appellation sits on the hillsides of Mont Brouilly, a prehistoric volcano that left blue schist stones and volcanic rock along its slopes. These stones yield structured wines with pronounced minerality and great aging potential.